That it was close to conveyance stores and where I wanted to go and there was not so much traffic noise and I felt welcomed and did not experience any disruptions. The owner checked us in as we got there earlier than anticipated and it happened to be raining on and off . Very nice of him to do that very friendly and understanding gentlemen. Everything was available for our convenience. All Good. 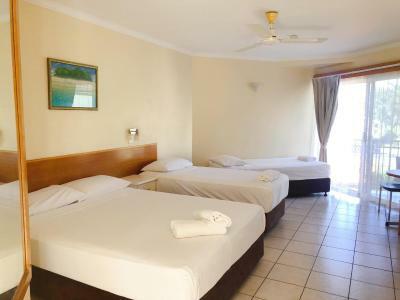 Comfortable beds, quiet and plenty of parking space. There are 2 pools and they were both clean. Off street parking is available with lockable gates at night time. 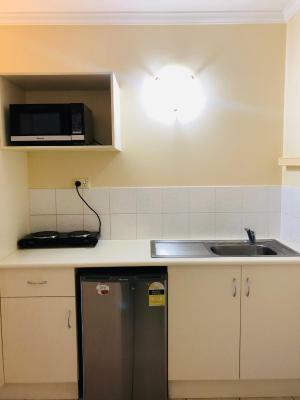 Small fridge in the room and also had a bathtub. The young girl at reception was extremely friendly and helpful. The room was ground floor opening onto the pool. The location was 10 minutes from the local tavern. Tropical Queenslander This rating is a reflection of how the property compares to the industry standard when it comes to price, facilities and services available. It's based on a self-evaluation by the property. Use this rating to help choose your stay! 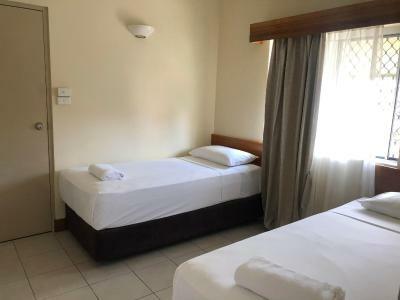 Just a 2-minute walk from the Cairns Esplanade waterfront, the Tropical Queenslander features an outdoor pool, a restaurant and poolside BBQ facilities. It includes affordable studios with a kitchenette. Central Cairns is less than 1.5 miles away. Located just 350 feet from the hotel, the Steak on Lake Restaurant serves modern international and Australian cuisine and is open daily for breakfast and dinner. A grocery store and various dining options are within easy walking distance. 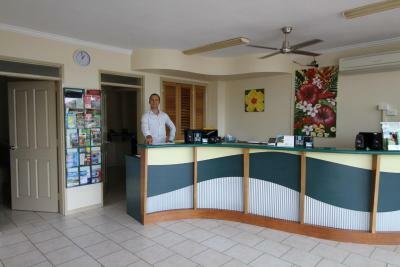 When would you like to stay at Tropical Queenslander? This studio has a kitchenette and a private bathroom with a shower. Some studios also include a bathtub or a private balcony or patio. This family studio has a kitchenette and a private bathroom with a shower. Some studios also include a bathtub or a private balcony or patio. 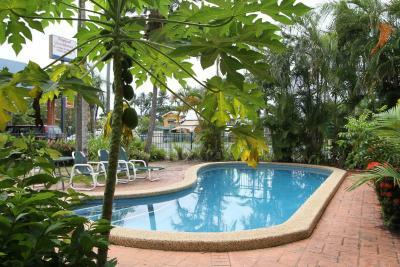 At Tropical Queenslander, your comfort is our business. We love to entertain our guests and make sure that our guests are happy with our services. Just give us a call, your request will be immediately attended. If we could not deliver our service as said, we are happy to refund your money. House Rules Tropical Queenslander takes special requests – add in the next step! Tropical Queenslander accepts these cards and reserves the right to temporarily hold an amount prior to arrival. For after hours check-in, please contact the property during reception opening hours, to arrange key collection. Luke warm water from hot tap to have a shower. Bed so comfy. Great shower. Only 1 sheet on bed, no comforter or blanket etc. No spider or web in bath, not having hot water it was only like warm then went cold, no blankets if you wanted to use the air conditioner. No washers. The tv reception was very poor and The Ariel was held up with bandaids. No tissues. A bit lame aye? Allocated room had a horrible smell and I couldn't stay in the room - reported to reception and apparently it was a chemical smell from the carpet cleaning. I was relocated to the next room. I was concerned about the security of the room as there were lots of people walking around in the evening and the locks looked flimsy. In the morning, I tried to leave by the back gate, but it wouldn't open; so I had to manoeuvre the car within a full carpark and try the front entrance - apparently it had a sensor gate which was very slow - I was concerned about missing my plane. I did find that the room was filled with the smell of damp carpet but it didn't bother me that much. I don't know because I only stayed 1 night. 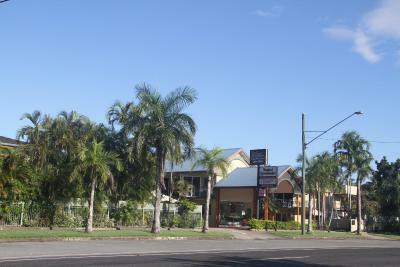 No operational restaurant onsite or supermarket as it was our first time in cairns .